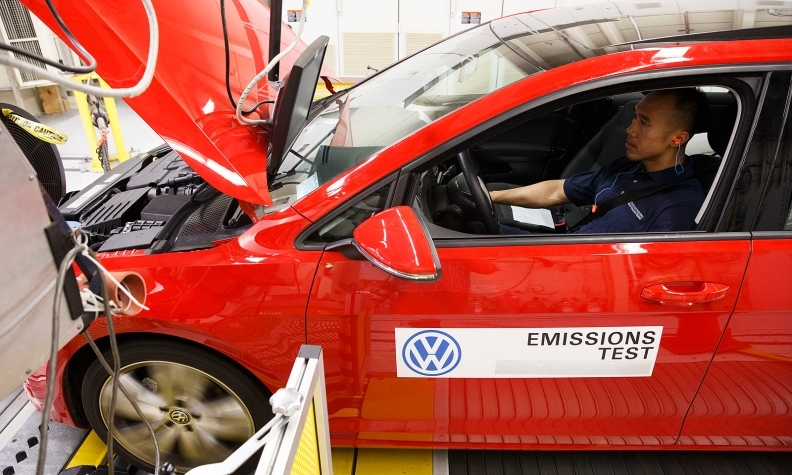 A worker tests a red 2016 Volkswagen Golf TDI emissions certification vehicle inside the California Air Resources Board Haagen-Smit laboratory in El Monte, Calif., on Tuesday. WASHINGTON -- The confession of cheating that's embroiled Volkswagen AG in one of the biggest scandals in auto industry history came on a cool California morning, on the sidelines of an academic conference focused on green transportation. After more than a year of stonewalling investigators, Volkswagen stunned two senior officials with the EPA and California's environmental watchdog by admitting the automaker hacked its own cars to deceive U.S. regulators about how much their diesel engines pollute. That disclosure on Aug. 21, confirmed by two people with knowledge of the exchange, shows Volkswagen buckled to pressure from environmental regulators almost a month earlier than the scandal was made public. The admission to regulators came after a year during which VW officials insisted to regulators that tests on its diesel cars showing a spike in pollution levels on the road were in error. U.S. officials exposed the deception on Sept. 18, triggering Volkswagen's admission that it had installed software in its cars to detect when they were being tested and alter settings to conceal the true emissions of 11 million cars sold worldwide. The delay between VW's confession and the U.S. exposure of the scandal occurred as regulators prepared their response to the disclosure. As a result, Volkswagen, the world's largest automaker by sales, faces EPA fines that could reach $18 billion, class action and other lawsuits that could add billions of dollars more in liability and a U.S. criminal investigation. VW's leadership is in turmoil after chairman Martin Winterkorn was forced to resign and sources said other executives including the head of U.S operations were soon to follow. Now, the story of how investigators unraveled systemic cheating in the face of consistent denials from the company may have implications for the sanctions VW will face and for an auto industry certain to face more scrutiny about its environmental claims. The company's lack of cooperation could figure into punitive action by the government. At first, regulators were surprised that Volkswagen would make its confession at the conference, held in Pacific Grove, Calif.
Minutes before Christopher Grundler, director of the EPA's transportation and air quality office, was to deliver a 9 a.m. speech to the conference, a Volkswagen representative told him about the deception. At the same meeting, representatives of the California Air Resources Board, a state agency that had been pushing VW hard, were also given a verbal notice of the deception, people with knowledge of the events said. Volkswagen declined to comment on the sequence of events described to Reuters. It isn't clear who the VW representative was who delivered the news of the deception to Grundler and the CARB. Stuart Johnson, head of VW's engineering and environmental office in the United States, was registered to attend the Aug. 21 conference, which was organized by the University of California, Davis. Johnson, who still works for VW in Auburn Hills, Mich., did not respond immediately to a request for comment. Norbert Krause, who was head of VW's U.S. environmental office until 2009 and who retired from VW in 2011, said nobody at Volkswagen of America was involved in the process of engineering the diesel cars. "I don't know anything about the modification of the software," Krause said when reached by telephone in Germany. "The software was okay when we certified the vehicle and we made our durability runs. Everything was fine." Grundler: VW's confession about emission tests and the use of defeat-device software came minutes before a California speech. A formal acknowledgement of the deception came on Sept. 3, when the EPA and California officials held a conference call with Volkswagen executives in Germany and the U.S.
During the call, the automaker went over written details provided to the participants explaining how software used in its diesel cars was able to manipulate emissions tests in the United States. That admission came after the EPA threatened to withhold approval for the company's 2016 Volkswagen and Audi diesel models, according to a letter sent by the EPA to Johnson and VW's attorney. The letter detailed some of the timetable of the EPA's actions. Volkswagen had heavily marketed what it called "clean diesel" engines starting in 2008 with the 2009-model Jetta TDI. It appeared to have found a sweet spot between high-performance and fuel-efficiency with a zippy, fun-to-drive car that topped 40 miles per gallon in highway driving. Named "Green Car of the Year" at the Los Angeles auto show in 2008, the Jetta TDI was seen as a breakthrough in a country where diesel passenger cars occupy a tiny niche compared with Europe, where they are about half of the market. "It's not your grandfather's diesel," Krause said in a September 2008 presentation to U.S. regulators, according to a video of the remarks. By that point, VW and other automakers had lobbied for almost a decade for regulators to give diesel another chance. In 2000, VW and other companies with an interest in promoting diesel, including Mazda, formed the Diesel Technology Forum to lobby for increased use in the United States as a way to reduce reliance on imported oil. In 2005, an energy bill signed by President George W. Bush offered tax credits for diesel buyers. That gave the first wave of diesel Jetta buyers an income tax credit of $1,300 each. Around the same time, in Europe, regulators were skeptical. A European Commission study concluded in 2013 that European car makers were exploiting test loopholes. Separate findings by the EC's Joint Research Centre showed a discrepancy between test results and real world performance in European diesel engines. California began its inquiry after EC regulators sought to obtain American data on the on-road emissions performance of diesel engines, said Stanley Young, CARB's communications director. The Europeans had a working theory that diesels should run more cleanly in the United States, where regulations are stricter, than in Europe. The WVU researchers placed emission-monitoring equipment on a rented 2012 Jetta and a 2013 Passat. Over seven weeks in spring 2013, they drove the cars around Los Angeles and up the West Coast to Seattle, comparing them to a BMW X5 sport-utility with a diesel engine, said Daniel Carder, who led the WVU team. While the BMW's emission results came in under what the vehicles produced in laboratory tests, those of the Jetta were 15 to 35 times higher than the legal limit and the Passat 10 to 20 times higher. Soon after, the same rental cars tested by WVU were monitored in CARB's El Monte, Calif., test facility east of Los Angeles. There were no irregular emissions. 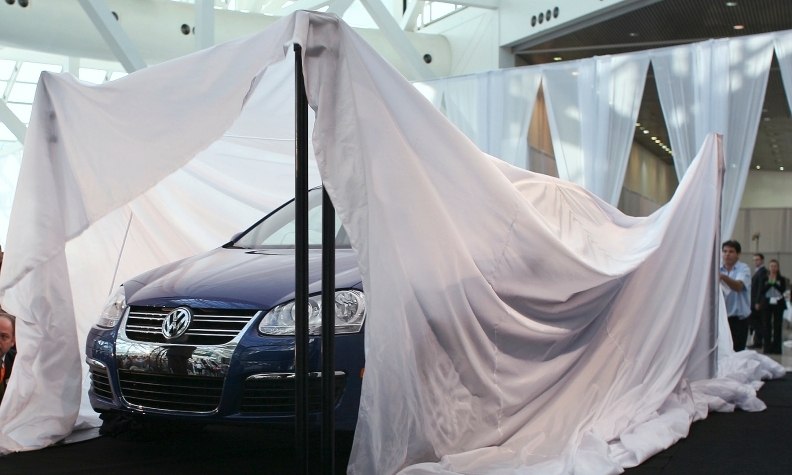 Covers are removed from the 2009 VW Jetta TDI as it is named the Green Car of the Year by Green Car Journal at the L.A. auto show in 2008. It was the first time that a clean diesel model had won the award. "That data put our executives on alert that there was clearly a problem for the U.S. and California," said Young, the CARB official. At meetings between California officials and Volkswagen that began in the summer of 2014, engineers from the German carmaker tried to "discredit the findings" by challenging the data and methodology of the study, Young said. "They were recalcitrant," he said. "It was a range of issues. Every time it was something different." Among other things, VW said that "our calibration was off" and that the discrepancies had to do with "the conditions under which the test was done," Young said. On Dec. 2, Volkswagen shared the results of its own tests, blaming its increased emissions on "various technical issues and unexpected in-use conditions," according to the EPA. Then Volkswagen agreed to recall vehicles to fix their engine-control software. Engineers at CARB kept testing and found the proposed software fix did not significantly reduce emissions. A break came when they looked at diagnostic data stored in the cars' own computer system. "We discovered some very strange anomalies," Young said. "For instance, the car was running more cleanly when it was cold than when it was warm, which is the opposite of what every other car does - because once you warm a car up that's when it begins to deliver its best pollution controls. This was not the case. So clearly something else was going on. Over time we assembled enough proof and questions that they could no longer provide any reasonable explanation for what was going on." On July 8, CARB shared its results with VW, but there was no change in Volkswagen's position. Some officials privately questioned whether Volkswagen was deliberately violating the federal Clean Air Act by installing defeat devices -- software programmed to switch engines to a cleaner mode during official emissions testing, according to a person involved in the process. In early August, Oliver Schmidt, who followed Krause and preceded Johnson in VW's U.S. engineering and environmental office, attended a conference in Traverse City, Mich., and told regulators Volkswagen stood by its conclusions that the problem was technical, said people involved said. Schmidt declined to speak to Reuters. "I'm just amazed," said Alan Lloyd, who headed CARB from 1999 to 2004 and helped open California's market to diesels. "Why someone would think they could cheat in this way and get away with it is beyond me."